Exercise GEORGIAN BUGLE was 6 RIFLES and the British Military’s first adventure training expedition to Georgia. This came about as 6 RIFLES have been given the Defence Engagement role for the South Caucasus’s which include Georgia, Armenia and Azerbaijan. 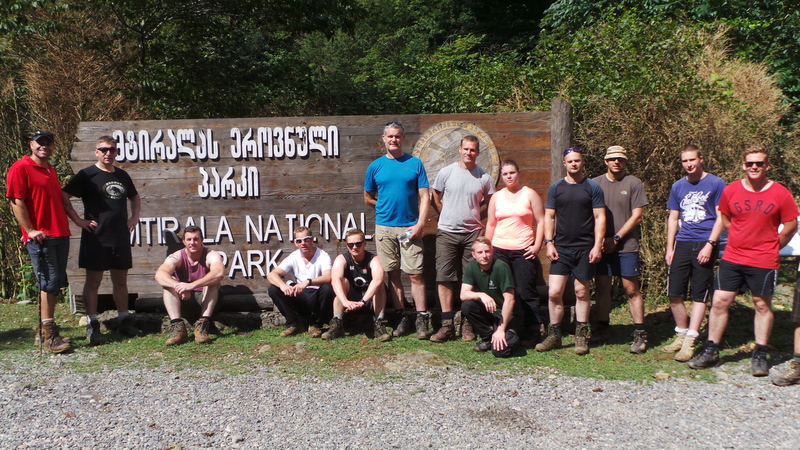 As the Expedition Leader I went out to Georgia in May 15 and carried out a Recce on the trekking routes, accommodation, vehicle availably and medical care. We decided to stay within 4 hours of a major hospital just in case, so decided to use Batumi as our base in the West of the country which borders the Black Sea. Our Expedition consisted of 2 x 1 week periods of 7 days, where each group would trek for 5 days. There was a mixture of mountain life and being self-sufficient, with experiencing Georgian hospitality in a lodge. It all started for each group with the issue of their rations, waterproofs, tent and cooking gear before they headed to Heathrow and met as a group for the first time. 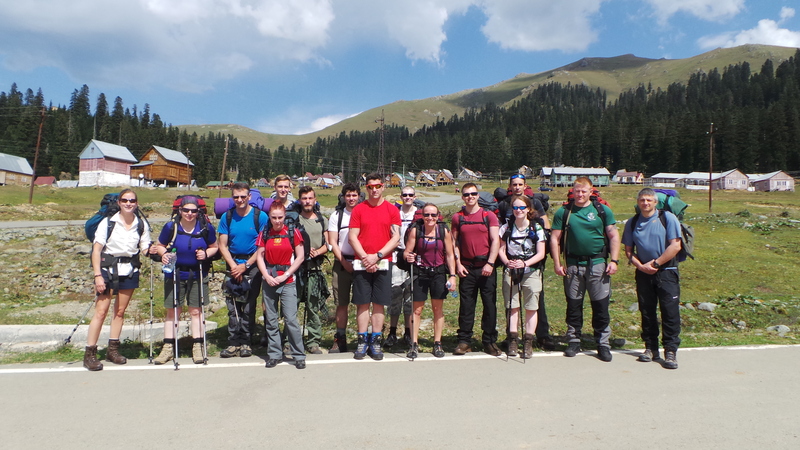 Both groups bonded really well and used Military humour and collectiveness to help each other through some tough days trekking. The journey to Batumi is not a nice one, with a flight change in Istanbul. It’s there where you have to wait 9 hours before connecting, not nice and it’s through the night too. This just means when they arrive having been travelling for 20 hours, the last thing they want is an arrival brief! Sorry but that came next. Home for the next night was in the Georgian Military Barracks, it wasn’t Hilton Hotel standard, but after a long journey everyone slept well. The group then headed to Bahkmaro which was a 3-4 hour drive away. They experienced Georgian driving and the sight of pigs, cows, horses and goats lying in the road. The next 4 days and 3 nights the groups were in the mountains. Their main aim was to ‘develop individual courage and leadership skills through controlled exposure to risk in a challenging outdoor environment’. Through this all students gained the ‘Summer Mountain Foundation’ Qualification too, this was fantastic and great to see for all involved. Both groups were greeted in the mountains by friendly villagers who offered warm food direct from their home and a wave to say hello. They trekked to heights of 2755 Metres on Mount Sakornia and 2599 Metres for Mount Khino. They enjoyed a dip in Mountain Lake and a cultural chat with the Georgian trekking guide who talked about life in Georgia since its independence in 1992. The group’s fourth mountain night was spent at ‘Shoka Lodge’ in Mtirala National Park. They had beds again and were able to freshen up, so were so pleased. They also enjoyed a local Georgian BBQ, so as you’d expect there was lots of meat. It was an early night for most after an exhausting few days. A continental style breakfast was served the next morning and a trek to a waterfall. This was nice for all concerned as it was the first time they didn’t have to carry a tent, cooker and clothing. We all enjoyed cooling off under the waterfall and relaxing for a while there. 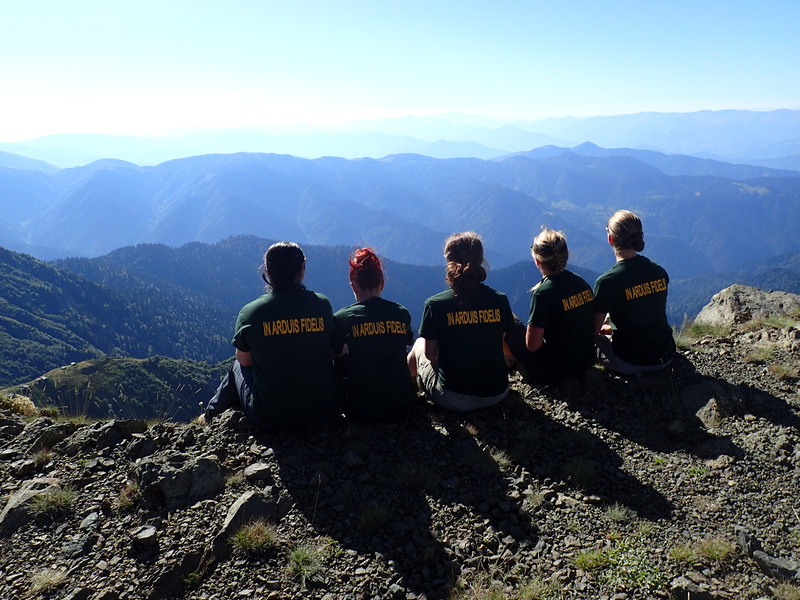 It was then the trek out of the National Park to meet the transport and head back to Batumi. The first group were really lucky as the Salamanca Band of 6 RIFLES were on their annual camp in Georgia at the same time as the Adventure Training package was taking place. We headed back to see them play at the Piazza in Batumi along with the Defence Attaché, our Commanding Officer and local council members. It was a great way to end off an enjoyable week. A superb experience that was assisted by the Battalion and without the support of the Ulysses Trust would not have happened. A huge thank you. Our 5 Royal Army Medical Corps members on Week 1 looking at what lays ahead. Group 2 having finished the trek at the Mtirala National Park entrance.